Our values (Double competency Assurance/Advisory, P/ragmatism, Technology products independent, Deontological ethics) are the cornerstone of our engagements quality and success. We think that double competency Assurance/Advisory is a key factor of success for our clients. During our assurance engagements and the reporting phase, advisory experience allows our consultants to recommend pragmatism and realistic solutions and/or actions. During our advisory engagements, assurance experience allows our consultants to advice solutions both aligned with market best practices and organization strategy. Pragmatism is an ITekia perpetual requirement. 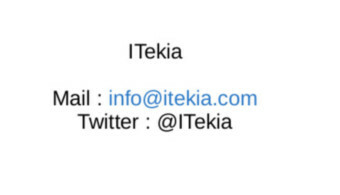 ITekia solutions are designed to satisfy our clients real Information Security needs without being complex to implement. Futhermore, aiming to bring best of classes solution to our client needs, ITekia keeps a strict independence with regards technology vendors, providers or resellers. All our engagements are led by experimented consultants sharing the same values and ethics. French and English speaking professionnals with International Backgrounds..